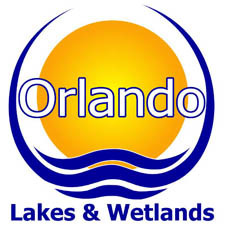 Orlando Lakes and Wetlands specializes in large lake systems and the more difficult to control aquatic plants including hydrilla, milfoil, cabomba, alligatorweed, water hyacinth, water lettuce, coontail, floating bladderwort, slender spikerush, babytears, cattails, torpedo grass, primrose willow, wild taro, duckweed, water lilies and filamentous algae. Spray platforms include 16’airboat with spray rig, 14’ Carolina Skiff with spray rig, Work Horse ATV with spray rig and back packs. 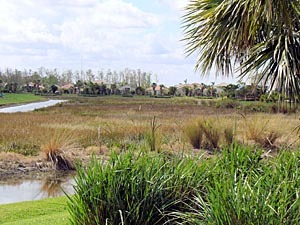 Stocking of Triploid Grass Carp and Tilapia: Grass Carp require a permit in Florida. 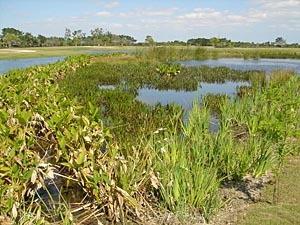 Tilapia are allowed only in Central and South Florida. Fish Barrier Installation: Fish Barriers are required by the Florida Fish and Wildlife Conservation Commission as part of the Triploid Grass Carp permitting process. Fountain & Aeration System Maintenance: Fountains need routine cleaning of intake strainers, nozzles and lenses. Aeration Systems need routine cleaning of air stones and air filters. Water Clarification: Application of Aluminum Sulfate (Alum) to flocculate or clear turbid water.